Do you want to drive more buyers and prospective buyers to your company’s website? 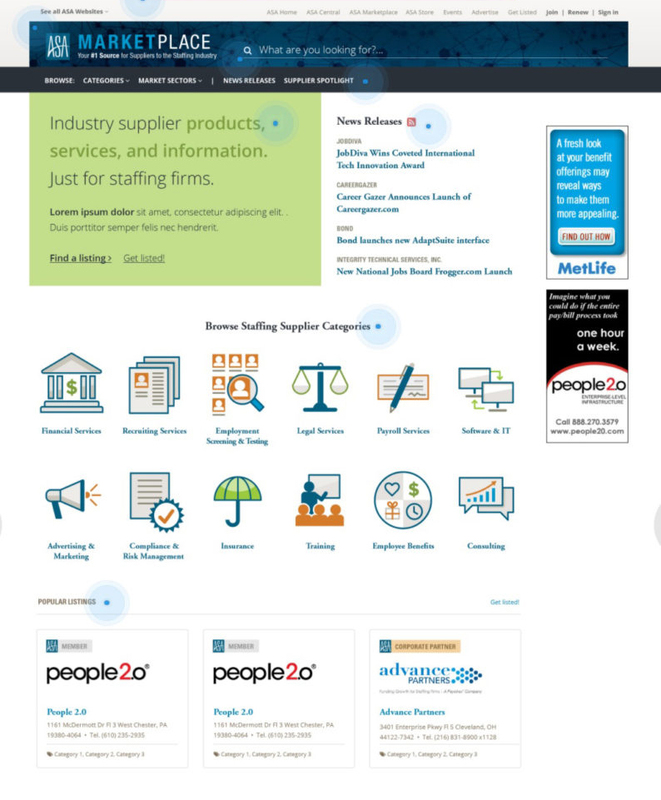 The newly relaunched ASA Marketplace—the highest-profile and most-trafficked online buyer’s guide serving the staffing and recruiting industry—has been expertly designed to connect buyers with your company. Make sure your company has its strategic listings across targeted product and service categories in place now. Why Should You Enhance Your Visibility in ASA Marketplace? ASA is the nation’s largest trade association of staffing and recruiting companies with more than 1,800 staffing firms—which includes more than 17,000 branch offices. ASAmarketplace.net features an average of 2,000 site visitors per month, and the relaunch is sure to drive even more traffic. The ASA Marketplace is heavily marketed to members in resources such as americanstaffing.net, ASA Central, monthly emails, newsletters, the Staffing Professional Catalog, the association's magazine and other publications, the member welcome kit, at ASA events, and more. 74% of staffing and recruiting professionals who receive ASA publications and visit ASA websites are involved in purchasing for their organizations. 73% of surveyed ASA members agree: ASA publications and resources have made them more aware of industry products and services that have helped their company learn more about industry suppliers and their offerings. More than 35,000 individuals receive the association’s daily newsletter, Staffing Today, and bimonthly magazine, Staffing Success, and the ASA Marketplace is promoted in both publications. ASA members value their publications: Six in 10 staffing professionals say they read at least three of every four Staffing Today issues they receive. As an associate member of ASA, your company receives a free basic listing in ONE ASA Marketplace category. To upgrade your listing, purchase additional categories, and enhance your online presence and visibility, contact the ASA sales team at 703-253-2020. This premier online destination features more staffing supplier categories than ever before, making it easy to pinpoint exactly what shoppers are looking for. Navigating through an array of industry suppliers is a user-friendly experience, and buyers can choose the suppliers that best fit their company needs in an instant. Associate members of ASA get discounts, preferred placements, and other benefits related to advertising, exhibiting, and sponsoring opportunities. Check out the ASA Prospectus. Questions? Contact the ASA sales team at 703-253-2020.